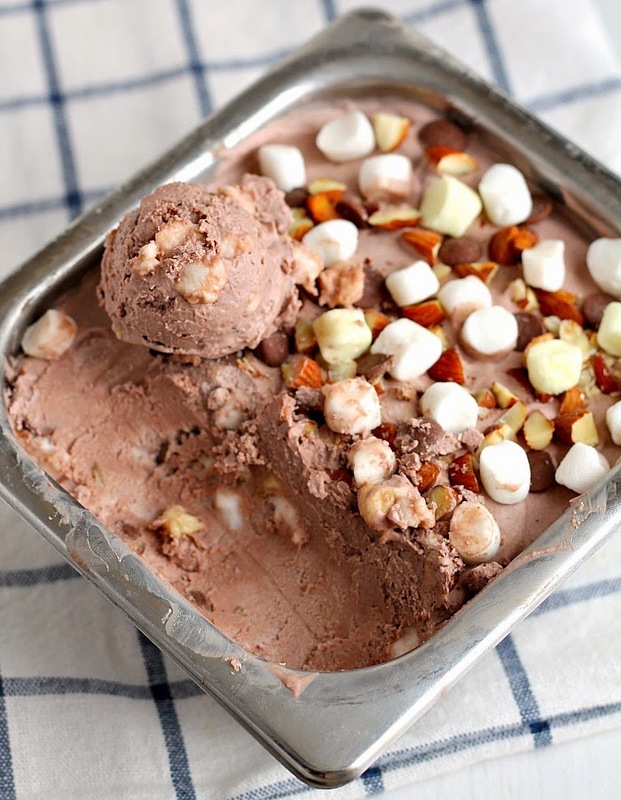 my bare cupboard: No-churn rocky road ice cream "
My last homemade ice cream this year er hopefully , not ! The weather's a-changing here , the 30° yesterday was tolerable and a bit cooler compare to the same temperature we had few days ago . I really need to use the cream least it'll go stale again ( I chucked more than 500 ml of whipping cream few days ago *sigh* ) , so making this ice cream is a no-brainer . This is a spin from the no-churn vanilla ice cream that I've seen from Yen's blog last week and planning to add melted chocolate but changed my mind , so I made this rocky road version instead . The original rocky road ice cream , according to Wiki , is traditionally composed of chocolate ice cream , nuts and marshmallows - no chocolate chips is added before . Now , some recipes are based from vanilla ice cream with chocolate chips , almonds and marshmallows . Don't like rocky road flavor ? Use any berries that you like , lemon or lime curd , melted chocolate or any flavor combo that you can think of . * Pour the cream and the condensed milk in a large mixing bowl and put it in the fridge to chill , put the beater in the fridge as well ( sans the machine ! ) especially if it is hot in your side of the world . * Using a handheld electric mixer , starting on low speed , beat until the cocoa has dissolved then turn up speed to medium and beat until thick and stiff , add in about 2/3 of the chocolate chips, almonds and marshmallows , use a spatula and stir to combine . Transfer into a freezer container , top with the remaining chips , marshmallows and almonds and cover with cling wrap . Freeze until solid , at least hours or overnight , if you can wait that long . * Before scooping , let it set at room temperature for about 5 minutes to soften a bit . Wow Ann, love this ice cream and your beautiful photos! This looks yummmmmm... Plus it is really easy to prepare! Best... Tks! LOL! I was reading DL's website on freezing cream just last week! Haha! I tried it once before, but the cream separates! It doesn't work for me, but maybe I would have to give it another try with cooking cream this time. 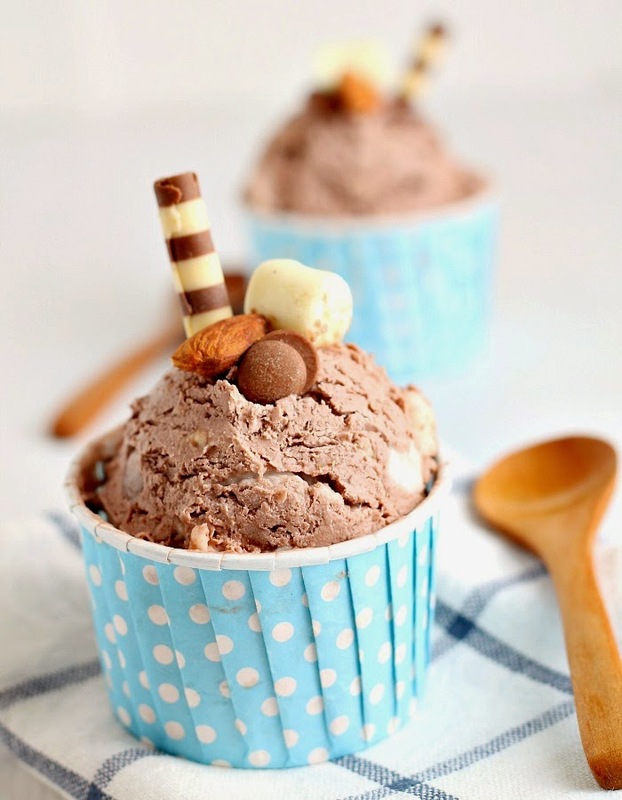 Love ice creams but i hardly make them because it will be hard to control myself from eating, so i have a cup of your luscious looking rocky road ice cream, please? You can post as many ice cream recipes as you want love to drool over them. Hi Anne, thanks for the mention. 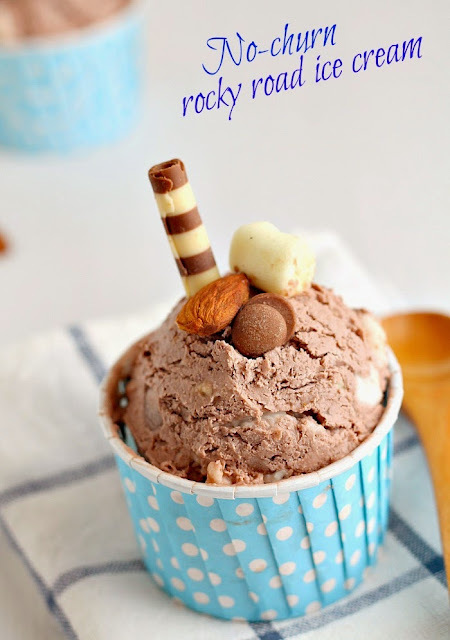 I would love to try this rocky road version... bet my kids would love it! What a same about that cream, Anne. Well, you'll know for the next time. I should say,however, I have found when I freeze cream that it usually doesn't have the same consistency until you "whip" it up. Thank you so much for sharing, and yes, if you would send me that pasta link that would be great! wow this is one dang rich and delicious ice cream, Anne. This looks sooo good! I can't believe i thought I needed to churn ice cream. I'm free and this is the perfect way to celebrate said freedom. Delish! Whoa, this looks fantastic!!! Perfect way to beat the heat! I've turned on our furnace...but I'd still be willing to eat a bowl of your ice cream! Good Morning Anne, My daughters will fall in love with you when I tell them about your easy method for making Rocky Road ice cream as it is one of their favourites. I am going really looking forward to making this ice cream this weekend. I love your blog and I have become a new follower. oh gosh, this looks really tempting and easy to make too! i do hope to make some ice cream at home..hopefully it's not going to wait till next year :) as for freezing the cream, im quite surprised to read that.. i remember freezing mine at one time and in the end, i just got to throw them away :( ..
oh, you always made so tempting ice-cream ! !